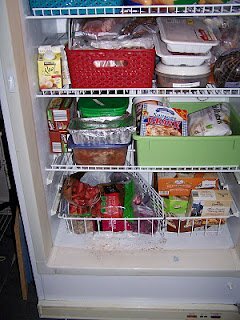 Lots of people have taken the organize freezer challenge, which is part of week #4 of the 52 Week Organized Home Challenge. As usual, the participants of the challenge have outdone yourselves with organizing this area of your home, and I know that your efforts will make your daily life in the kitchen easier and more enjoyable. If what you see below inspires you, I'd urge you to take the challenge yourself. You can read this challenge here. Before you begin to organize though make sure you declutter, which as I say a lot around here, is always the first step in any organization project. 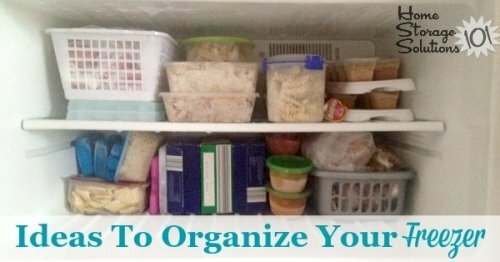 So here's the declutter your freezer mission to get you started. Then, once you've removed all the old food it will be time to organize. 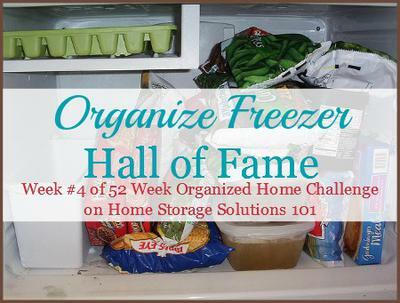 Take all the steps in the challenge, making sure to take some before and after pictures, and send them in to me at the Home Organization Hall of Fame, and you might just have your freezer makeover showcased here too! 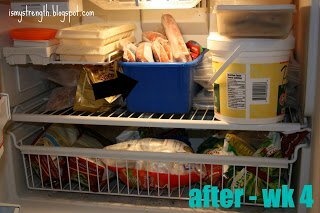 Jan from The Crafty Mermaid's Grotto shared both before and after pictures of her upright freezer, as well as the smaller one she's got above her fridge. I could only choose four to show off in this hall of fame post, so I chosen mainly her "after" pictures. You should check out her blog post for all the before pictures too, since there was a great transformation. I know a lot of people really want an upright freezer instead of chest one, and at least from an organization standpoint I can definitely see their point. 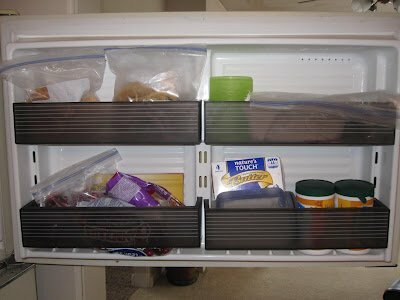 With a chest freezer you've got to use freezer baskets to organize, but they are all stacked on top of each other making it difficult to find what you need, at least without a freezer map. 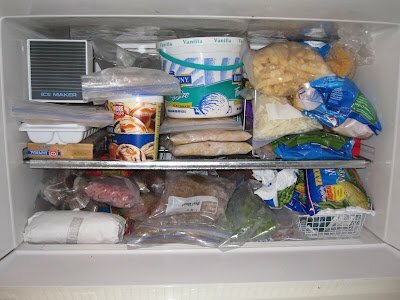 On the other hand, I am in awe of the organized look of Jan's organized upright freezer. She too used baskets for organization, but as you can see it is so much easier to get to each basket when they are on shelves. I bought these plastic baskets from Target. They have a wide weave, so air can move through them and they are STURDY! I like these baskets, since they are really cute and do look sturdy. I would caution that plastic, when it gets cold, can get brittle and break, so it may be a good idea to buy baskets designed for the freezer to alleviate this problem. However, if you can find some cute cheap baskets you may want to try it, and just switch them out if you notice one of them starting to get brittle or crack. If you're looking to avoid this issue, for sure though, I'd go with wire metal baskets (I've listed some of both below as examples). 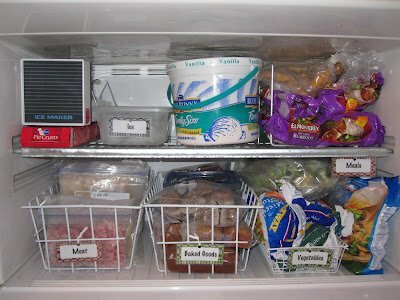 Megan from Life of the Lorenzens organized the freezer that sits above her refrigerator with baskets and labels. The baskets are awesome for keeping like items with like, and from having everything spread out too much in the space. 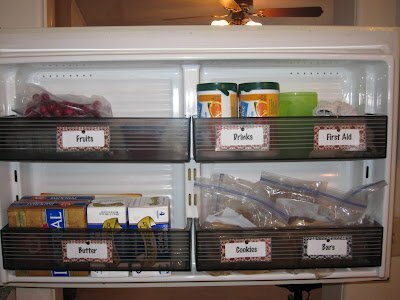 And the labels are very helpful for the whole family, who can now know easily where everything goes and keep the organizational scheme up much more easily as things are put in and taken out. I made labels on the computer on an address label sheet and stuck them on cut up pieces of scrapbook paper. Then I laminated them with clear contact paper that I found in the attic upstairs and punched holes in the top. They can either be taped on to containers or I can use a white twist-tie to attach them to a wire freezer basket. I made a few extras as well as some blank ones if I decided to do things differently at any time. 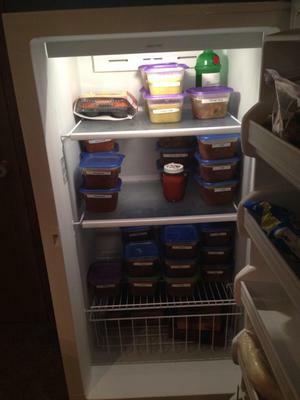 Leigh from Joy and Strength shared an after picture of her small freezer above her refrigerator, shown above. She explained: "I use a thick plastic bin to hold all the sausages, hot dogs etc & the bottom drawers holds veggies on the right & fruit on the left." Often we think of baskets or bins being used in a chest freezer, but this is a good demonstration that such items can easily be used in whatever type of this appliance you've got! Here's another example of using bins to help you organize, shown by another reader, Sarah. Lee-Anne from Life In A Peanut Free Shell tackled two different freezers as part of this challenge. I've only shown the after pictures here, but you can check out her blog post (link above) for the before ones as well. She had two different freezers to work on, the little one above the refrigerator, as well as a small bar freezer. Before this challenge she had things just crammed into both of the appliances rather haphazardly. She took the time to rearrange items, moving all like items together. That meant it no longer had an equal chance of being in either freezer, but she and her family would know which one to look in for the item they wanted. She explained that it's "so much easier to find stuff and so far it’s been a great way to keep track of what needs replacing when we go shopping!" 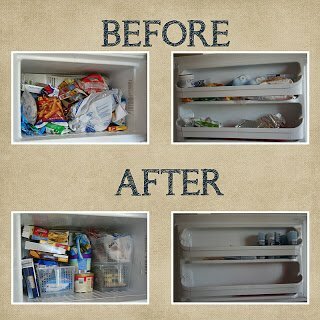 Angela from Confessions of a Craft Addict shared pictures of her organization efforts for two different freezers she's got in her home, which you can see above. First, she has a side-by-side freezer, next to her refrigerator, and in addition, she has an upright freezer where she stores produce from her garden, from the co-op and also food gifts from friends and family members. 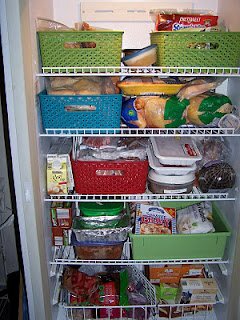 If you've got a garden or get fresh produce from a co-op freezer organization is essential, since you've got to be able to preserve all that produce while its fresh, for use all through the winter and early spring. The pictures Angela shared are a great example of how to do it, where you can find what you need, when you need it. 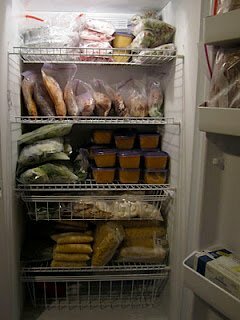 Notice her use of both freezer storage containers, but also how she uses freezer storage bags to store lots of her produce. 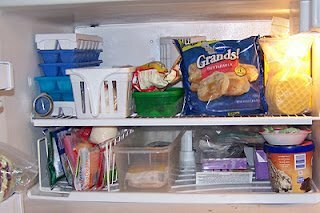 I love using freezer bags for storing things, since they take up so much less room than actual containers, and that way you can pack a lot more food into a small space. It doesn't look like she actually uses a FoodSaver vacuum sealer system for some of the produce packaging, but she easily could. 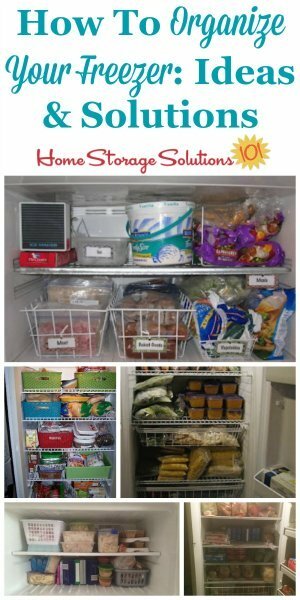 Click the link for an article for tips for using this product to help you get your freezer organized. 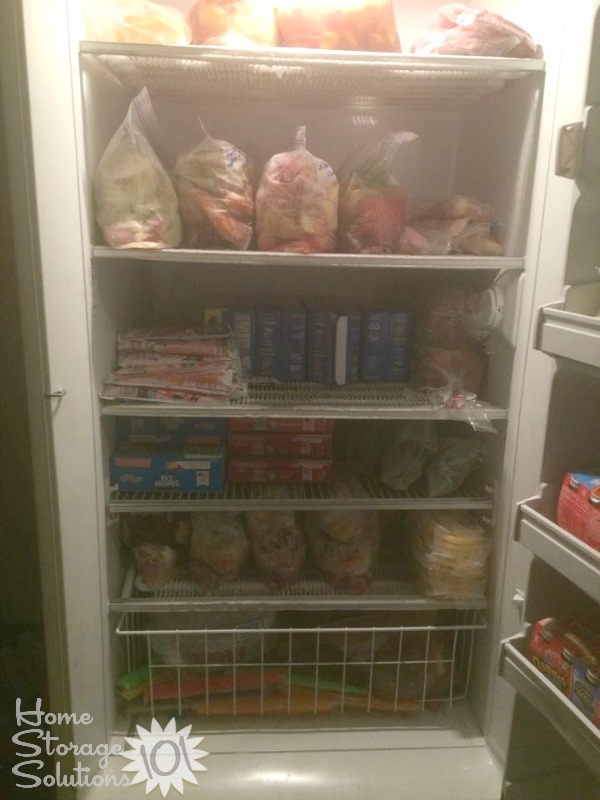 Here's another organized upright freezer, shown by a reader, Stephanie. I like the cubes since they maximize space. Pop one in the crockpot and you've got dinner! Thanks for sharing your picture Patty. Yes, it just makes complete sense logically that square and rectangular containers will take up less space, in general, because you can push them next to each other, along with stacking them. Round containers are notorious space wasters because even pushed together there is space in between! 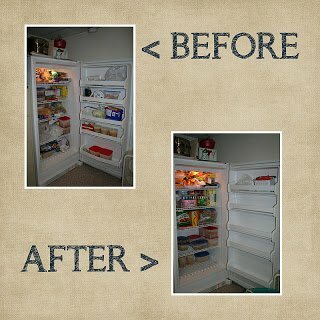 Jennifer from shared before and after pictures of both her upright freezer, and the smaller one above her refrigerator. 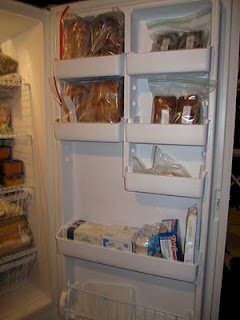 She organized both her freezers into various sections or "zones" to help her find what she needed, and know what she was running low on. 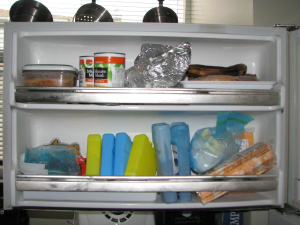 She said, in regard to her upright freezer: "Here is a list of what I put on the shelves, from top to bottom..."
4. "mystery" containers (plan is to take out 2 a week to thaw, if good we'll eat, otherwise I'll have a backup dinner to eat). 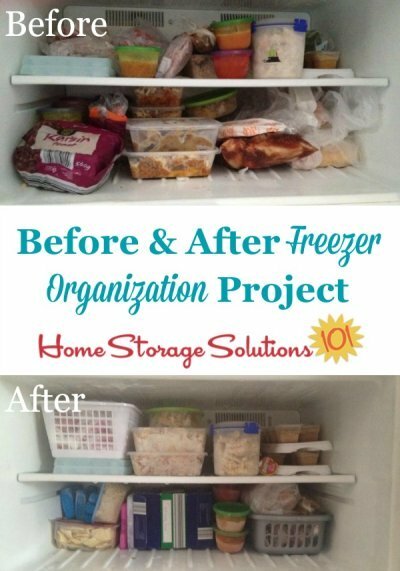 I hope these before and after pictures have inspired you to get your own freezer in order. If you've now caught the organizing bug I would encourage you to join the 52 Week Organized Home Challenge here on the site. Over the course of the year we get your whole house in shape, room by room, item by item, and developing consistent positive habits as we go. Further, if you do get your freezer in order I'd love to see some pictures. You can share your organizing triumphs with me here and I'll add them to the hall of fame. I use plastic bins from the Dollar Tree to organize my freezer. Mine fits two big bins on the bottom and extra room for items that don't go in bins. Or you can fit a smaller bin. The top row fits one big basket and room beside for other items. Then I fit flat items where the ice trays go. 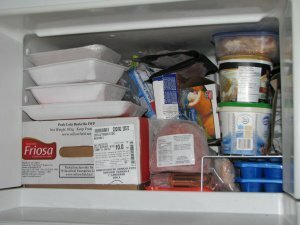 how do you organize a bottom drawer freezer? I have one of those bottom drawer freezer, I'm not sure if it's even possible to organize those. Everything is kinda tossed in there. I'd love to do something about it. I have a side-by-side. 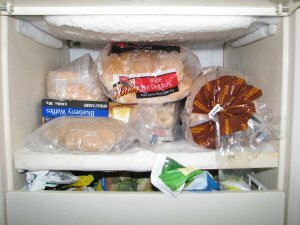 Bottom "bin" holds wrapped frozen meats. Next shelf up holds a basket with frozen fruits and veg. Then, commercially prepared (turkey burgers, etc) foods; top holds cocoa, extra bread and nuts. I even made hanging labels with index cards and zip ties for when Mom comes to visit. Makes meal prep so much easier!! I saw the comment about the bottom freezer drawer and wanted to say how I organize it. I already have an upright freezer downstairs. I use the bottom drawer as follows: upper left is the ice maker, upper right is an extra bag of ice, lower left is for ice cream/desserts/veggies, and lower right I take out 4 nights worth of frozen meat so I don't have to run downstairs all the time. Thanks for posting that! 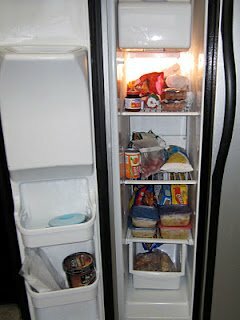 It inspired me to explore thee depths of my side by side freezer. I discovered I had tons of ground beef, because not knowing what was in there I just picked some up A LOT. Earlier I sorted through some cabinets where I keep books and hadn't looked in there in quite some time. Now have room for the bag of books I bought at the senior center Book Sale. I am glad I discovered your page! Wow, I'm a couple of days behind due to illness, so today I went to look in my freezer!!!!!! My plan of action: look out for freezer baskets, and eat from the freezer this week. I have a side by side refrigerator/freezer. Because the freezer is so narrow I have a horrible time organizing it. Any ideas would be great! I have a refrigerator with a bottom freezer. I do not like it and and searching for ideas to help me organize it. I would never buy this type again! I also have the bottom pull out freezer and have about given up on keeping it organized. Any pictures of success with this type freezer would be helpful. Deep bins are my only idea. Help! I have a bottom freezer. I noticed the other day that a narrow ice bucket fits perfectly in mine. I want to get some and put chicken in one, green beans in one, breakfast foods etc. I package my meat in individual pkgs. for my diet. I think the individual pkg. of vegetables would fit into them also. Has anyone used Wet Erase (Vis-A-Vis) Markers on their freezer doors? I'm feeling like a printed inventory sheet will not work well for me as I continually add and take out items from the freezer, but something I can erase and add to on an ongoing basis might work. I'm wondering if a Wet Erase marker would work on the outside of my freezer door and not leave lingering stains? Then, again, maybe just a few sheets of laminated paper, tacked onto the front, might do the job with less concern of the wet erase markers staining the door over time? I put meals that will not feed the entire family in half the drawer, and the other half is for processed meet. The shelf has desserts, ice, and the meals for the week (I use reusable zip lock bags) the "snack" will hold a pound of hamburger, sloppy joe, taco meat, pulled pork, and the "sandwich" most other meals. The basement top meals for the family in zip lock bags in bins. Second shelf family meals that do not fit ie enchaladas, and ingredients (I cooked a bunch of dry beans package in can size bags). Sides and veggies. Third shelf big meat ham and whole turkey occasionally whole chicken. 4th shelf bread and dairy. Door has breakfast food. 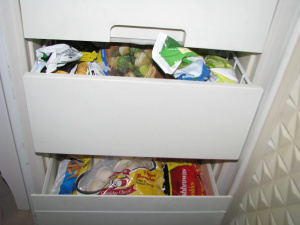 Bottom is a drawer that divides in thirds processed meat, fruit and nuts, raw meat. Door prepared breakfast. I make a list of the things I usually have and put it in a clear plastic sleeve (got at dollar tree in the school stuff) then I can write the unique items in dry erase. I put a magnet on the back, but now you can buy them that way. I bought a small white board with magnets that I put on my freezer door. I divided it into 4 sections since my freezer has 4 shelves. I write what I put in the freezer in the appropriate section. And erase when I take out. I have a vertical line to show what is on the door in the correct shelf. Hope this makes sense & helps. I have a drawer freezer. I organized it by bins that I could lift out. It has worked great for me. Also good tip for me was that you can freeze things in mason jars! I have a side by side freezer in the house and a larger upright in the Garage. I've ordered a couple of plastic bins to see how this works for my side by side because every time I opened the door things fell out. I will only keep a max of 5 days meat in there too so hopefully this will help. Thanks for the encouragement. 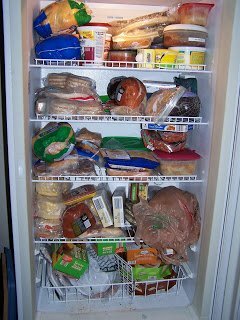 For many years, I've done OK organizing & maintaining an inventory of the contents of my upright freezer and top-freezer of my refrigerator. However, my new bottom-freezer refrigerator with the freezer drawer is presenting new and unexpected challenges. Surely, others have figured this out, and I would be grateful for any and all suggestions.